Student App Design – What do you think? Today we signed off the specification of design of the first release of the learning analytics student app. We expect an IoS and Android version of the app to be available from March 2016. The first release will be based primarily on the existing overview discussed in the previous blog post, Student app for learning analytics: functionality and wireframes but we have been listening to feedback and comments over the past month. 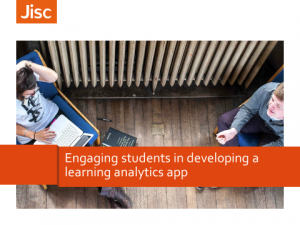 The Association of Learning Technologies Conference (ALT-C) 2015 provided one opportunity to consult on the learning analytics student app. The presentation from the session is available here. The session at ALT-C included three activities which allowed participants to ask questions and make comments. 1. Comparative – seeing how you compare with class averages or the top 20% of performers for example may provide a competitive element or at least a reality check, driving you to increased engagement. 2. Social – being able to select “friends” with whom to compare your stats may add another level of engagement. 3. Gamified – an app which includes an element of gaming should encourage uptake by some students. This may be manifested in the use of badges such as a “Library Master” badge for students who have attended the library five times. 4. Private by default – while data that the institution knows about you from other systems may be fed to the app, the privacy of any information you input in the app yourself will be protected. However anonymous usage information may be fed back to the app backend. 5. Usable standalone – by students whose institutions are not using the Jisc architecture. 6. Uncluttered – the app should concentrate for the time being on learning analytics data and not be bloated with functionality which replicates what is already present in the VLE/LMS or in other applications. The general feeling was that the principles were a good basis for the app development and some useful feedback was given. Risk of de-motivation. One challenge discussed was that providing comparative data could be de-motivating or result in half the class being below average, in a normal distribution of marks. The suggestion was that any data should show progression and added value to remain motivational. The option should be included to only see their own data and see a longitudinal view of their own performance. Gamified. There was a concern that gamification could be abused or cheated. There was a preference for an overall engagement score or learning activity score based on several data sources that individual measures on use of the VLE or access to the library. Too specific measures could lead to meaningless gamification. There was also a request to include institutional badges rather than generic ones. Comparative. The range of data being used to determine engagement or achievement for the student app may need to be wider than is sufficient to make broad predictions in the learning analytics processor. The project will need to build on research from existing projects in the sector. Students may want to compare their performance with students in groups such as mature students, other students with dyslexia or disabilities. It was noted that comparison groups will need to be large enough to ensure individuals cannot be identified unless friends have agreed to share data. Private by default. The consent functionality was essential to ensure that learners were clear about what self-declared data they were sharing on their learning activity. It was felt that learners may want to take away their self-declared learning data and that it needs to be accessible beyond the length of the course. This suggests a requirement longer term for a personal learner records warehouse that is external to the institution. The general feedback was very positive on the wireframes and basic functionality, the main request was when can we start to use it? The answer is still from March 2016. The app will eventually be available on all platforms including a web app and that it would be open source and available as a white label product so it could be integrated with existing or local student apps and systems. It was felt that using terms like “lowest 20%” is not motivational and a different approach will need to be found, maybe looking at suggested grade points. There was a request that students would be able to see all the available badges and the activity required to get a badge. This will help the students to set achievable targets. Having seen the specification for the first release I know this will be a feature and that they will be called Trophies not Badges. 1. A way to direct students to existing support or help based on the learning analytics data. This requirement will initially be provided via the Alert and Intervention Management system. 2. A comparison option to allow students to request to join groups and to opt in or out of groups. 3. Access and reading activity of core course materials. 4. Linking the learning targets to tasks from a calendar, learning objectives or assignment deadlines and templates for common activities. 6. Personal configuration and customisation. 7. To be able to question the data with someone. 8. Students to see what they to do to achieve the next grade. The developers will start in October and you will be able to test the app with students from March 2016. I doubt we will get it perfect first time, so expect to see some changes as we pilot it with students. However it is going to provide us with fascinating opportunities to get some real insight into how students learn and what motivates them to improve their learning activity. 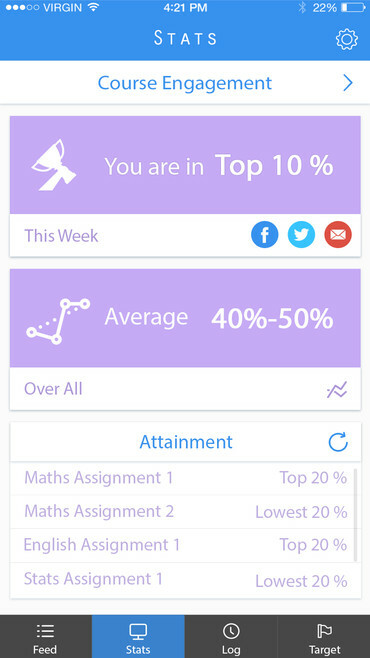 What excites me most about the app is the opportunity to offer students a tool that can improve learning by changing behaviour, encouraging engagement and increasing motivation. Posted by Paul Bailey on September 28, 2015 in Student App, Systems. I’d been designing a OPEN SOURCE (Teachers) Social Network since a couple of years, looking for help to implement it. Reading your article, I think your app is just the frontend of my project.